George Deiderich started his football career at Valley Forge Military Acadamy in Wayne PA before moving on to college football at Vanderbilt. Deiderich was an All-Amercian in football at Vanderbilt in 1958 and also participated in Track & Field where he set a school record i nthe 120 yard high hurdles. Deiderich was drafted by the Los Angelas Rams in 1959 in the 23rd round of the 1959 NFL college draft. 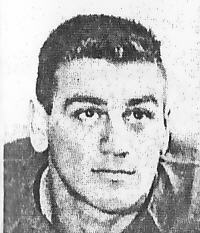 Deiderich came to the CFL in 1959 and played two and a part years with Montreal (1959-61), and completing the 1961 season with the Ottawa Rough Riders. Listed as a Guard, Deiderich also played some defense, recording a 52 yard interception return for a touchdown in 1960 with Montreal. George Deiderich passed away from cancer on July 2, 1999.